The Silver Muse Veranda Suite is perfect for luxury cruising. It is the most spacious suite in its class, it has designer finishes, a hotel-style bathroom as well as a dedicated butler. Plus, as you will see in this luxury cruise review, it has a spectacular veranda too. Silversea pioneered the ultra-luxury veranda suite. Now they have perfected it. In fact the Silver Muse Veranda Suite is a model of understated elegance with designer touches and luxurious finishes. Plus, of course, there is an extra-large veranda with room for stylish outdoor furniture. It’s a great place to watch the ever-changing views. But I think having a butler at your disposal is one of the real treats of a Silver Muse Veranda Suite. In fact he’s likely to spoil you rotten! He’ll keep the suite just the way you like it. He can make dinner reservations and book tours. He can even help pack your luggage. And what’s more your butler is available for most of the day (with the exception of a break in the early afternoon). See how the Silver Muse Silver Suite compares. Take a glimpse inside the Owner’s Suite. 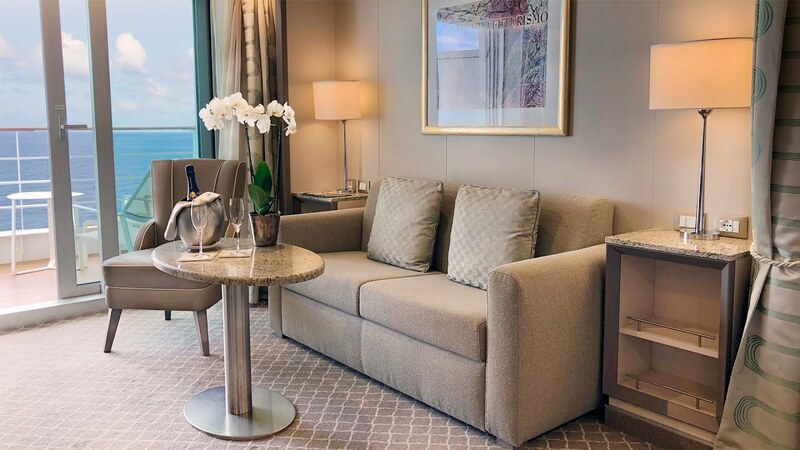 Regular Silversea guests will be familiar with the layout of the Silver Muse Veranda Suite. The real difference is in the decor. The pallet has soft hues of teal, cream and dove-grey. While the furnishings have elegant, modern lines. It all has the effect of making the space feel even bigger. The Silver Muse Veranda Suites are located toward the front and middle of the ship. This was another Silversea innovation which ensures there is never any noise disturbance from the public areas. The Silver Muse Veranda Suite is the biggest in its class. There’s more space to stretch out and relax than in any other veranda suite. Indeed, each suite has 30 sq. m. / 323 sq. ft. of internal space, as well as a veranda measuring 6 sq. m. / 64 sq. ft. The Silver Muse Veranda Suite floor plan. The Silver Muse Veranda Suite floor plan is like a junior suite in a hotel. The living space has two distinct zones – there is a bedroom as well as a sitting/dining area. Floor-to-ceiling glass doors lead on to the fully furnished veranda. There is also a luxurious marble bathroom as well as a walk-in closet. The Silver Muse Veranda Suite is the ultimate expression of understated Italian elegance. There are soft tones of teal and cream with dove-dove-grey accents as well as gold and chrome highlights. It also has a great designer look. The Silver Muse Veranda Suite has Italian elegance and style. This modern Italian living space is divided into two zones. There is a restful sleeping area and a comfortable sitting area. The sleeping area has a queen or twin bed setup – the choice is yours. There are also Pratesi® Italian luxury bed linens and the mattress is very comfortable. In addition there is an extensive pillow menu which includes feather, hypoallergenic and even buck wheat stuffings. The buck wheat pillow was surprisingly good! Above the bed is a soft, hand-crafted leather bedhead, while on either side there are night stands with generous storage spaces. There are also bedside lamps and multidirectional reading lights. A thoughtful extra is the handy bedside power unit with both US and European points as well as a USB slot for charging your mobile devices. Also, a 42-inch flat-screen television is cleverly hidden behind a mirrored wall opposite the bed. You wouldn’t even know it was there! At the other end of the living space is the sitting area. It feels very spacious. There is a plush sofa and convertible coffee table on one side, together with a designer high-back armchair. While on the other there is a marble-topped writing desk and mini-bar. A second 42-inch flat-screen TV is mounted behind a mirror over the writing desk. Having two televisions is a real luxury. For me the best part of the Silver Muse Veranda Suite is the veranda itself. In fact I think it’s the perfect place to relax with a good book or a sunset cocktail. The veranda is the perfect place to watch the ever changing view. The veranda is very spacious. There is ample room for the stylish outdoor furniture which includes two chairs with ottomans as well as a cocktail table. Plus, every veranda is also very private. However, it’s worth noting that the veranda is not actually teak, but rather a faux-teak surface. This is quite a departure for Silversea who have always had genuine teak verandas on their classic fleet of luxury cruise ships. The reason for the change is simple. Teak has become very expensive. It is produced in only four countries; Myanmar, India, Laos and Thailand. Myanmar supplied 75% of the World’s teak, but in 2014 they introduced an export ban. This sent prices sky-high, which is why teak is disappearing from the verandas of even the most luxurious cruise ships. Indeed, walking on the teak decking around the pool is now like walking on gold! The bathroom in the Silver Muse Veranda Suite really impresses. It is covered in fine Italian marble and has a beautiful timber floor that gives it a luxury spa look. The marble bathroom includes a full size tub. There is a full-size tub as well as a separate rainwater shower. The glass door of the shower closes tightly, so there are never any leaks. Also, there is a single, large basin and plenty of room for storage around the vanity area. There is also a walk-in rainwater shower. The vanity has plenty of storage space. When I sailed on Silver Muse there was a selection of luxury bath products including Bvlgari and hypoallergenic options. The Silver Muse Veranda Suite comes with luxury Bvlgari bath products. The Silver Muse Veranda Suite has lots of storage space. There is a walk in closet with hanging space for at least two cases full of clothing. In addition the closet has a set of drawers as well as space for shoes. There is also a safe. The walk-in closet has lots of hanging space. If you need it, there is also more storage space in the cupboards under the writing desk in the living area. Once you have unpacked there is also plenty of room under the bed for storing cases, even the large hard shell variety. There are 242 beautifully appointed Silver Muse Veranda Suites. They are spread across five passenger decks, from deck 5 to 9. There are three Silver Muse Veranda Suite categories – Classic, Superior and Deluxe. When choosing which category is right for you there are some important points worth noting. Veranda Suite positions onboard Silver Muse. Firstly, there is no physical difference between the Silver Muse Veranda Suite categories. They are all the same size and have the same decor. The only difference is the position on the ship. Classic Veranda Suites: These are positioned on the lower decks toward the front of the ship. Superior Veranda Suites: Like the Classic category these suites are found toward the front of the ship, however they are on higher decks. Deluxe Veranda Suites: These suites have the best location. They are all found midship which means they experience less movement in rough seas. The cost difference between the Classic and Deluxe categories can be significant. However, on certain voyages it may be worth paying the extra. For instance, on long ocean crossings a Deluxe Suite would have a more comfortable ride.